Today my client was a hyperactive - cheeky - mouthy young lady!! Jumping up - lots of 'social graces' to be learned - and pure pedigree German Shepherd and at three months old was definitely in need of some training!! German Shepherds are very intelligent dogs but also need to be kept both mentally and physically stimulated and active as can in latter years suffer from hip problems if not regularly exercised. It is very sad to see this magnificent breed when they have been kept as 'security dogs' kept in small contained areas or chained and put out on industrial plants as 'guard dogs' - with such limited exercise and movement they lead a lonely and isolated life often ending their lives early and suffer hip dysplasia. Will be going back in 10 days to see how 'guardians' and 'Sheba is doing and see who is training who! First Dog Surgery in Queens Park Westminster opened this monday - giving advice on neutering/spaying, getting a new dog and all aspects of being a responsible 'dog owner'. This Dog Surgery will be fortnightly and between 2pm and 3.30pm and FREE to all members of Queens Park Ward and Harrow Road Ward. Also non dog owners are welcome to voice their views both negative and positive on how 'dog owners' and their dogs affect their enjoyment of public spaces and environmental issues regarding dogs mess left on the streets of both Westminster wards. I think it is important to have someone and somewhere to go to seek advice regarding dogs especially when living in a multi culture community where sometimes the smallest dog can seem to be intimidating if not under proper control. Also there are new laws regarding dog legislation being updated on a regular basis especially for 'bull breeds' and owners should be kept informed of these laws and advised on the Dog Control Act. In Westminster wards it is against the law to have your dog not on a leash if in a public place that is not an 'assigned dog area' - a fine can be imposed for this and also for not picking up after your dog - these fines can be issued by a dog warden - an environmental warden and a police officer. Also if your dog is reported or seen to be acting in an antisocial manner or left unattended in a public place - it can be siezed and if it is a 'bull breed type' can be taken under the BSL and kept in a unknown location to be assessed. You also might need advice on basic puppy training or you have just adopted a rescue dog from the local shelter @mayhewanimalhome or alldogsmatteruk - also any local microchipping events or dog classes in the area information will be given out to all dog owners. So whatever your 'enquiry' is please come along and visit www.canineculture.co.uk for a friendly chat and a cup of coffee!! Training pups - it is so important to start socialising your young pup as soon as they are fully vaccinated - and if you have just rescued a pup from your local shelter www.mayhewanimalhome.org.uk or dogs trust or any local rescue start socialising them as as possible. I like to call my dog classes 'dog socialising classes' because one of the most important factors of owning a dog is for them to be good with other dogs and familar with the public and their local environment! 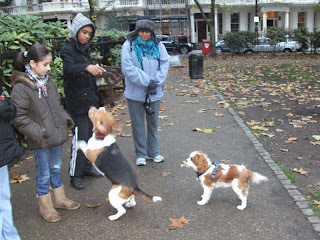 Last Sunday I held my third dog training session in Maida Vale W9 in the Dog Area Enclosure in Paddington Recreation Ground. This is an ideal training ground as it has the wide open spaces and also three enclosures to practice 'recall'. I also like my classes to be small - no more than 6 pups or 6 dog owners (to allow for owners with two family pets) - too many dogs in the class can be overwhelming to pups entering the 'Big Bad world of Our's and also gives both owners and pups my full attention!! This weekend is World Animal Day - the Feast day of St Francis of Assisi - and the Reverand Graham Noyce of St Martins Church Mortimer Road NW10 5SN invites all pet owners and their pets to be blessed at his church. The event starts 2pm at St Martins Church (two minutes from Kensal Green (Bakerloo Line and Overground) Station and Bus No 18 route). Living near the Notting Hill Carnival - I am happy to say the annual event went really well and the clean up was very efficient!! Chelsea my jack russell was VERY disappointed that the street cleaners did their job so thoroughly - NOT a chicken bone in sight!!! Also Great news - Tessa the lost seven month old romanian dog was found after two weeks AND before Carnival which was a great relief to her fosterers, her rescue and myself and Niz Khan - Rob of K9 Kennels and Amanda who spent many hours and days putting out flyers - and walking the streets of Holland Park W11 trying to find her. Buster a ten year old senior King Charles was adopted by a lovely senior lady who had lost her own dog a year ago and I saw Buster on All Dogs Matter Rescue website (a great rescue that deal both with dogs and owners with kindness and tlc) - It was an ideal adoption for two lonely seniors!!! I am working with Winnie a four month gorgeous labrador and would melt any man's heart but unfortunately is running rings around her owner!! We are doing a few follow up sessions and meeting again next week - after more doggy homework!! I did see a great improvement today so her owner is really working hard!!! 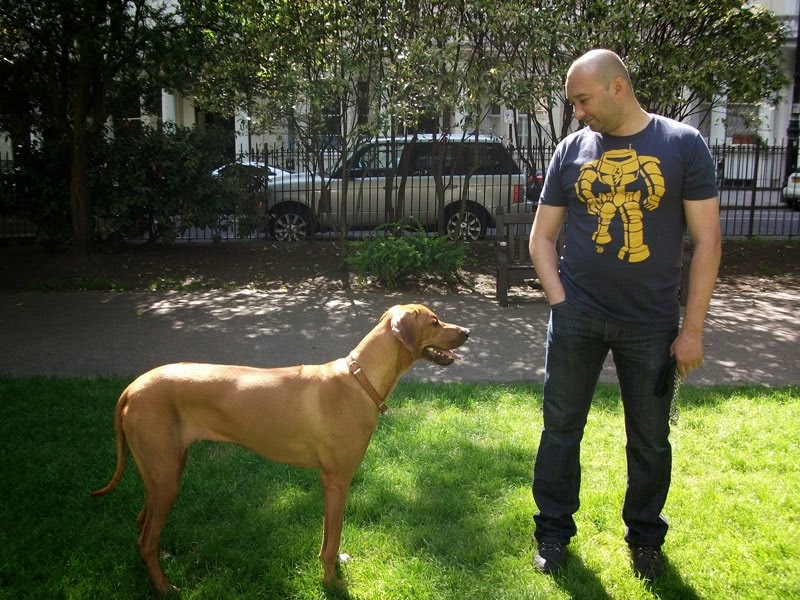 Dog Socialising Classes commence on 14th September 2013 in the dog area of Queens Park Gardens W10 - places still available for the 2.pm - 3pm class for Adult dogs. Enjoy the weather, Enjoy your pets and keep them safe! Maida Vale Dog Show to be held in the Dog Area of Padding Recreation Grounds on 31st August 2013 has now been put back to 28th September 2013. Judges will have to be notified - and new posters and flyers printed!! Also I have to meet up with the Park Manager of Paddington Recreation Grounds to see which dog area will be the best venue to hold the dog show event in! Last year it was the Dog area (Carlton Vale entrance) and it was an ideal venue - enclosed and ticked all the Risk Assessment Boxes and Pet Business Insurance Public Care and Liability Requirements. Jinny the Ealing Dog Warden was also going to offer Free Microchipping to local dog owners for their canines and has been notified of the change of date. The categories will be Ms Diva, Mr Slick, Best Senior, Best Rescue . Pup Idol and of course 'I luv my staffi' - great prizes (for dogs only of course) and rosettes will be given out on the day! After a great day of a successful Dog Show and the presentation of the Canine Community Cup to two worthy dogs and owners and a successful Queens Park Festival I came home jubilant and patting myself on the back - job 'Well done'!! Jinny the Ealing Dog Warden had had over 15 dogs who came to the same day FREE 'microchipping event' and I offered dog advice and helped register the dogs. All dogs Big and small - all breeds were well controlled and kept in check. By the time evening came - and I had walked my two pooches - I was ready for sleep - so all phones - computers were turned off until next morning! I awoke to learn that a rescue dog from Romania - Tessa a ginger and white crossbreed - was missing after one day with her new adoptors. Tessa at seven months - fostered in the countryside - now DogLost - frightened in London NW8. Suddenly all yesterdays 'feeling of job well done' was gone and I was along with other volunteer rescuers looking out there on the streets of NW8, W9 and W11 looking for Tessa! Ten days later we are still looking - we have had several sightings yesterday evening in Holland Park W11 and have set up a trap But we need more volunteers to man the trap and time is running out as Notting Hill Gate Carnival approaches this week end. Queens Park is celebrating Its Tenth Community Festival in Queens Park Gardens W10 and www.canineculture.com are helping them celebrate with a Canine Champs of Queens Park Dog Show. All dogs are welcome - big or small - chihuahua - staffordshire bull terrier - to strut and pose and all hoping to win great prizes and of course be Crowned 'Canine Champ' All dogs on leads and all handlers accompanied by an adult. Registration is at 11.45am at the Dog Area Queens Park Gardens W10 (Ilbert Street Entrance) - The Dog Show and Fun Begins at mid day. The judge will have the hardest job of all - choosing the winners and hoping not to offend the local residents - and thats just the owners!! Also there will be free microchipping for all dogs and advice on behaviour and dog control laws - this will be from one pm until five pm - so any dogs that are not microchipped should take advantage of this free service. Every year a dog owner (s) is picked out from the many dog lovers in Queens Park Community for their commitment and care and responsibility for their canine and how they have worked extra hard to improve their pets behaviour - or helped show a good example of responsible dog ownership. This year are two joint winners - Grace a rescued 'bait dog' whose owner Venetia worked so hard and with tlc and patience turned a nervous dog into a lovable companion who sleeps with her resident cat Joker - who rules the roost. The other winner is Olly a golden retriever whose young owners sold cakes they made themselves to raise over £80 for the mayhew animal home - a local rescue and came to every training class with Olly no matter what the weather was with dedication . Great day for dogs - big and small - from Bertie the french bulldog to Tyson the Staffordshire Bull Terrier - the rain stayed off for an afternoon of walking to heal - introducition of Tyson to small dogs and other staffies - and teaching Betty the pug (or her owner Heidi) that learning 'recall' and being of lead was 'fun'!! Then darling Rocco the lurcher came in with his new dog collar and much more calmer than he was in the last session!! Good boy Rocco you obviously 'did your homework'!! Romeo the little jack russell was tearing up and down with his new pals until he got a bit hyperactive - so back on the lead for him!! Jasper was trying to find where my 'training dog treats' were hidden - found the 'water bowl' instead. No matter what the weather always make sure you have water for the dogs during exercise and while walking - More so in hot weather. Sorry Bertie but your owners are changing the 'house rules'!! Bailey, Casper and Tuppence's owners texted me their apologies. Friday was such a beautiful day when out walking the dogs SO why when it is time for my Dog Training Class on Saturday at precisely 2pm the rain comes tumbling down!!! But then dogs have to go out and enjoy the experience of walking in all weathers!! Just not the perfect time for dog training!! First comes Jimmy and Jasper dragging their owner with her umbrella towards me - then Poppy the little westie who is a bit nervous of human contact - with her bright raincoat on. Then Samuel the Beagle who has incurred two 'nasty dog attacks within a few days of each other but thankfully with the help of his vet is recovering nicely - well physically anyway!! As the sun comes out between the clouds - Bailey the now very grown up labrador comes bounding up to me and then skids into a 'sit' position - like he just remembered 'something' from puppy classes. Followed by a quick appearance by Tuppence a terrier cross accompanied by his apologetic owner who unfortunately can not stay but will be back next week. A Beautiful ridgeback comes gracefully to my side - what a socialised treasure - one of my previous 'clients' - his owner asks if he can observe the lesson - of course - welcome all breeds - shapes and sizes and thats NOT just the dogs! Sadly Dusty the whippet has passed away since the last dog training class and his owners have got a new pure white whippet x from Battersea Dogs Home who needs help with nipping the little terrier who has just come in to play. Dog Owners get ready to sign up - disaster the registration forms are soaked from the earlier downpour - so will have to register next session - Sunday 23rd June. It turned out to be a great afternoon but also it was a very special day for Emma (Bailey's family) a young girl who is the bravest girl I know - for on Monday Emma will have a big heart operation and she talks about it with full insight yet so matter of fact and so brave - that as an adult I have to make sure I am half as brave and not cry. All of the dog owners in the area had made a special photo album of all the dogs and given Emma cards and teddies. We held a 'FREE Microchipping Event' at St Judes Hall Ilbert Street, Queens Park W10 - with myself and a dog warden from Westminster to give advice and general health check to all dogs in the area. Microchipping of all dogs will be a legal requirement in 2016 But why wait when so many of our dogs go missing, get lost or stolen and if they are microchipped the owners stand a much better chance of getting their dogs returned to them. Sitting here with my two rescues - Missy Blue a jack russell/whippet cross and Chelsea Rose a jack russell cross - one aged ten years and the other about seven years old - I can not imagine NEVER having a dog or dogs in my life. Yet what happens when I am older and the day comes when my 'precious canine pals' have passed and I want once again to 'adopt' and give my heart and home to another dog . What happens when my 'advancing years' are approaching - and even though I am active - healthy in body and mind - Suddenly my 'ability' to 'walk' 'care' and offer a homeless dog a safe and loving home is 'in doubt' by the very rescue centers I have always supported!!! Ageism in the 'Animal World' seems to be following the 'trend' of the workplace - and it is a sad day that 'shelters' and 'over zealous' administrators should judge us on a 'number' rather than on our ability to be a loving responsible adoptor of the numerous unwanted canines. When I heard the story of a lovely lady who had had dogs all her life, just lost her little terrier of 15 years and wanted to rescue another little dog and was refused!! One rescue she contacted had the perfect dog for her and everything was going well - UNTIL she told them her age! Suddenly the dog had been already adopted- only to appear on their 'site' a few days later. I met this lady - she is active - walks everywhere - lovely home with a secure garden and oh yes ----- nearly eighty. She doesn't want a pup - she wants a dog who she can share her life with for quite a few years to come - thank you!! through 'officialdoms red tape' and a focus on 'age' rather than a loving home here, at least in UK older animal lovers are being excluded from homing a dog. A cold day - a threat of snow but I was determined my 'dog socialising class' was going ahead!! I had arranged for the classes to take place in the (Dog Area) Paddington Recreation Ground W9 - a lovely big enclosure for safe and security for all the dogs taking part. With registration forms, (for Public care and Liability Insurance and monitoring for Westminster Council) - training leads - water bowls (yes even in cold weather it is still good to have access to water for thirsty 'trainees') I was already to go - just needed some 'dogs' to bring their owners!!! First to 'Bounce' through the gate was Ringo a lovely 'american bulldog' rescued from Bullies in Need - raring to 'socalise himself' with lots of vigor - then along came Junior a GSD x all the way from Spain - he was fearful of other dogs. Bella the labrador came bounding up to me - her owner holding 'for dear life' to the lead! Alaska and Arakeetall (beautiful names) two very friendly huskies - Alaska the female had a little stubborn streak and only wanted to do what Alaska wanted! Rocky a handsome six month lurcher/GSD x came in - needs to learn 'lead control' and to be more confident around other dogs. BB the staffie cross came in with Molly the Romanian dog rescue eight years ago - both determined to show the 'other dogs' how 'it was done' as they had been to 'quite a few' classes before. Oh and lastly but not least Little Ava a little staffie pup with her 'foster mum' looking a bit overwhelmed with all the 'Big guys'! Ava is from the mayhew animal home trenmar Gardens London NW10 - I offer a place in the class free to a puppy or dog from a rescue home for one or two sessions. The first class is always to assess the dogs and the 'owners' behaviour and to socialise the dogs with each other - all on leads - it is also important that owners discuss in a group their own 'views' on their dogs behaviour before we practice 'walking on the lead' together in pairs - and to show how to stop the dogs from pulling - using the 'block'. It was a great group of dogs - and I look forward to next Saturday 's session - and I hope they do too!! Its the first month of the new year and canine culture wishes every dog owner and of course their canines a great and exciting new year ahead. So far this month though the snow was great for our doggy pals to enjoy running and playing with snowballs and racing up and down in the parks and woodland!! - it was not the ideal weather for 'puppy training'!! Walking on lead and teaching adventurous or nervous pups not to pull when you yourself are slipping and sliding on the icy pavements is NOT a trainers or owners ideal training session - and definitely not for the 'pup in training' - the best weather to sit and stay, when a warm fire and their favourite bed was waiting for them indoors! So dog training classes and one to one sessions and assessments were put on hold until late January and Early February. Firstly I wanted to observe how Alfie and Ken's owners reacted to their behaviour - everytime they saw another big dog approaching they would verbally 'reassure' their dogs and saying 'Be good boys' - and don't bark etc. - what they were doing was condoning their behaviour - my training method is to use verbal or 'food' reward to praise a dog when they have done something to earn it only. I walked Alfie by my side and when he went to Bark I ignored him - stopped with the lead turned his head round to the side and immediately he stopped I verbally praised him 'Good Boy' and after a few stops - turns and 'good boys' he was walking more confident but without the barking and as for Ken he trotted by his owners side with not so much as a 'squeak'. Giving both owners doggy homework - for the next seven days - and then for our next session - food guarding! One of my other clients is Bella a chocolate labrador four months old - such a good student until that labrador's stubborn trait appears!! Perfect sit and stay - recall - its still a game of hide and seek for her owner - still early days. 'How do you do it Crissie - she comes straight to you - but not to me' her young owner cries - practice and patience and making yourself exciting and the main focus of your dog!! Back next monday for another training session with my canine 'peter pan'. 2012 was a year of - protesting for the end of a law that is NOT in touch with reality and judges the 'breed NOT the deed' - The BSL which condemns a 'bull breed' for what he looks like THAN whether he or she has committed any 'Deed' that comes under the Dangerous Dog Act or not!! We said good bye to Lennox on 11th July 2012 after he spent two years in captivity - imprisoned in kennels - with Victoria Stilwell and Roger Mumford amongst Lennox's supporters from around the world. RIP Lennox we are still fighting The authorities of Belfast for JUSTICE for you and your family! I met Peter Egan, Sarah Fisher Anthony Head - but best of all were all those Dedicated and Inspiring EndBSL supporters who came out in rain or shine to the Peaceful Protest in Westminster to spread the word - End BSL Now. 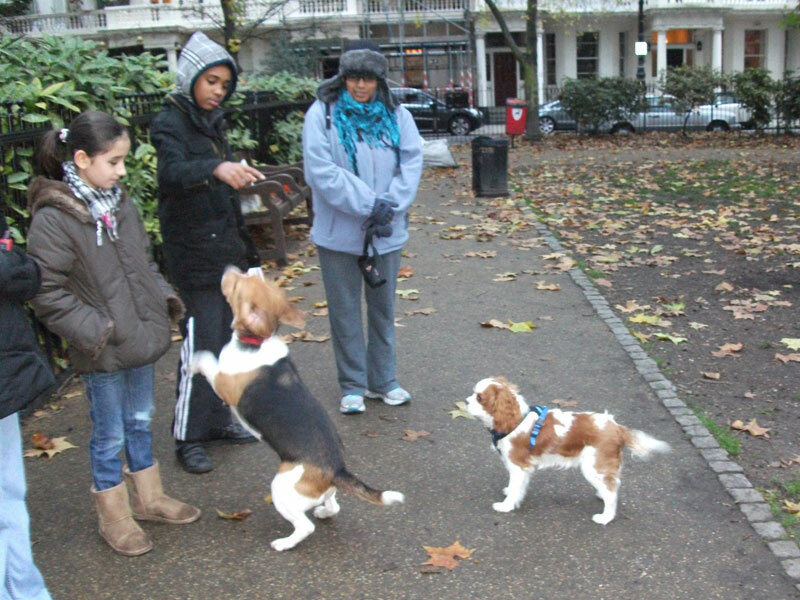 In 2012 I continued by dog socialising classes in the Harrow Road Ward, Queens Park Ward and the wards in South Westminster - promoting responsible dog ownership and socialising both dogs and owners. I attended with Missy Blue my jack russell cross in local educational events with school children in libraries and schools about 'Being safe and secure around dogs'. Held four dog shows featuring 'I luv my staffie' Ms Diva, Mr Slick and other categories. 2012 we petitioned for Anna the Elephant abused and kept in captivity for years to be freed and she now knows the safety and protection of a sanctuary where she tasted the joy of freedom. Along with Brian May we stopped (for now) the culling of badgers in UK and will continue our fight into 2013. Mozart, Buttons, Clash and Betty and Sebastian - felines abandoned on the streets of london got homes - Betty the tabby going as far as Gloucester! Cuba a blue staffordshire bull terrier was found after a massive united facebook appeal and reunited with her family. Ruth a 'cruelty case' found her dream home after a long wait - www.mayhewanimalhome.org.uk never gave up on her. Missy and Bru two romanian dogs found their forever home with my amazing friend Lynda Bryan and also I met the True K-9Angels - three glamourous ladies that work so hard for the animals in Romania, Thailand and other countries were their is no support or animal care for the strays. Many of us campaigned and tried to find homes not only for the poundies who have only 7 days to be rescued or reunited before they are euthanized - in UK but for dogs and cats in USA that were on Death Row. Maria Daines, Marsha Jones, Nicola, Lynda, Laura, Gary Kaufman, Sharon, Paul - Natasha Mason - Vicki - Coleen - AnnMarie - So many Animal Angels to thank for their commitment - dedication and Never giving up. Sadly we lost some beautiful feline and canine pals - Handsome Gentleman Dizzy - Magnificent Khan - Lovable Mutley a staffie I homed with a great family over ten years ago. Sweet Polo a little cat rescued from a hoarder who had over 150 cats and also Pookie. Georgie a little terrier, Tiny Jessie a little yorkie rescued from abuse. Louise's little Angel - May you and all the animals that died that could not be saved. May you all run free - free from Pain. May I wish everyone a happy new year and pledge to continue to fight for The welfare and protection of all animals, and to educate the uninformed - make laws harsher for the abusers NOT the victims.